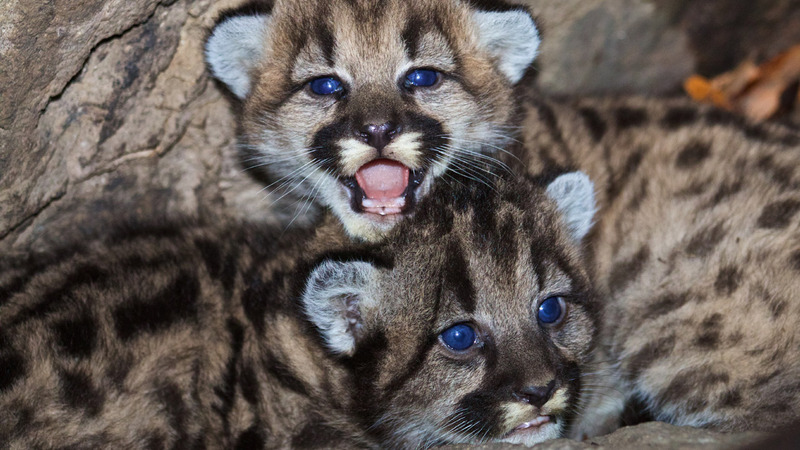 THOUSAND OAKS, Calif. -- National Park Service biologists discovered two mountain lion kittens hidden in a remote den in the western end of the Santa Monica Mountains. The kittens, now known as P-46, a female, and P-47, a male, were implanted with tracking devices after researchers found them. Jeff Sikich, a biologist for the Santa Monica Mountains National Recreation Area, said their mother is P-19, another mountain lion that has been tracked since 2010. "We continue to see successful reproduction, which indicates that the quality of the natural habitat is high for such a relatively urbanized area," Sikich said. "But these kittens have many challenges ahead of them, from evading other mountain lions, to crossing freeways, to dealing with exposure to rat poison." DNA testing is also underway for the kittens to determine the identity of their father, who may be P-12 or P-15, a newly discovered adult male. Researchers said two previous litters from P-19 were the results of inbreeding with her father, P-12. Inbreeding is a significant threat to the long-term survival of mountain lions in the Santa Monica Mountains because the animals are trapped within the habitat. This is the ninth litter of kittens marked by National Park Service biologists at that particular den site. Since 2002, the park service has been studying mountain lions in and around the mountain range to determine their survival in an increasing urban environment.